Soak daal up to 4-5 hours, then drain water. Take daal in a large bowl,mix all ingredients with daal.take care mixture should not be so thin. 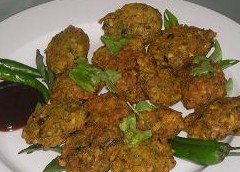 Make vada of it & dip fry them in oil till turn to golden brown. Serve hot with tamarind sauce. hi shruti, its a whole daal vade, u don't have need to blend any of ingredients.for binding daal u must hav to add besan(gram flour) in it.